At the Anime Japan 2018 convention this past weekend, Bushiroad conducted demo workshops with the Stardrive and Crested Dragon Star Decks, helping newcomers learn the rules and preview what the Standard format will be like when it launches in May. In addition to the free decks and Blaster Blade promotional card, participants were given a copy of the 2018 Vanguard beginner's guide with accompanying manga chapter illustrated by author Itou Akira. 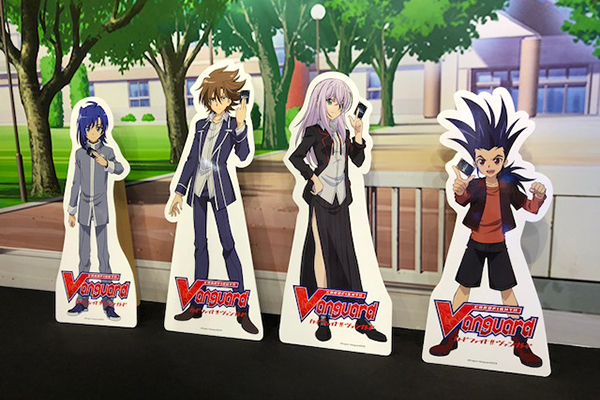 This was the first time the Crested deck was made publicly available; it will next be distributed in the May issue of Monthly Bushiroad magazine, before being sent out to shops April 7th. At the Tokyo MX booth, Kitta Izumi and Itou Ayasa appeared as part of a special panel to promote the TV segment "Monthly Bushiroad with Vanguard," which will be used to introduce each new episode of the next season of Cardfight!! Vanguard on its primary channels, Tokyo MX and Sun TV. These segments will air at 10:00 PM Saturdays and 3:00 AM Sundays Japanese time, beginning April 7th for MX and April 8th for Sun TV. Kitta has voiced Tokura Misaki on Cardfight!! Vanguard since the first episode debuted in 2011, and spent some time discussing how the character evolved. Itou Ayasa is the voice of Yatomi Saya in Cardfight!! Vanguard G, and the two of them will be cohosting "Monthly Bushiroad with Vanguard." While Vanguard's target demographic is in the range middle through high school students, and it has enjoyed a strong viewership among elementary-aged children, the new programming schedule puts the anime almost exclusively in late night timeslots with low exposure. The first season originally aired Saturday mornings at 8:00 AM, while its sequel Asia Circuit moved to 10:00 AM on Sunday. This is the timeslot Vanguard has retained throughout its entire run up until the final episode of GZ this coming Sunday, and some suspect Tokyo MX to be setting the series up for failure. 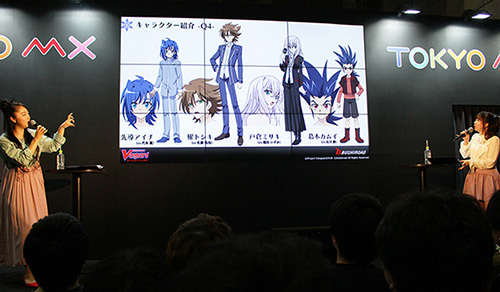 Poor ratings would make a handy justification to end their contract with Bushiroad; while four years ago CEO Kidani Takaaki could boast of three more seasons of Vanguard being greenlit at once, that kind of confidence is now a thing of the past. Bushiroad's sudden blitz of advertising, taking over the Yamanote Line and pushing demos out to more than three hundred stores nationwide, could be seen as the company taking appropriate responses to ensure the franchise's survival. Of note is that the new season's 9:00 PM slot on AbemaTV is the one most frequently advertised online, despite Bushiroad creating the Monthly Bushiroad block for Tokyo MX. The new anime series, codenamed "Origin," will begin airing May 5th, 2018, on TV Tokyo and affiliated stations. It will be simulcast with English subtitles on YouTube and Crunchyroll. Trial Deck 01: Sendou Aichi and Trial Deck 02: Kai Toshiki will launch in Japanese May 11th, 2018, and in English June 8th, 2018. BT01: UNITE! TEAM Q4! will launch in Japan May 25th, 2018, and in English June 22nd, 2018.